Still playing Spore? Compositing stretchy limbs and bulging organs? Shaking your double-tailed, spike-tipped derriere? Exploring not-so-strange "new" worlds? No? Bored with all that? Rather send your custom E.T. into battle and just bypass the peace and love stuff? Enter Darkspore, EA's "fast-paced and intense sci-fi Action-RPG" for Windows and OS X in which you battle across the galaxy to save it from "an ancient and powerful evil." If the plot sounds trite, the play mechanics promise better: A monster battle system premised on collectible creatures with discrete abilities, multi-deployable, and combat scenarios with multiple solutions, but that require careful squad-building forethought. We emailed Darkspore executive producer Michael Perry and software engineer Jeff Gates to ask about Spore's influence, creature evolution, real-time strategy parities, and to figure out just how expansive Darkspore's universe really is. Game On: Will it be possible to import creatures created in Spore, or is Darkspore connectively divorced from earlier installments? Mike Perry: Darkspore is a completely new game--it is not a sequel or expansion for Spore. However, Darkspore uses the creature-editing technology from Spore, and on top of that foundation we've made some significant graphics enhancements. We’re using part of that technology to allow our community to use the existing Spore Creature Editor to create enemy NPCs. There have been a lot of amazing creations made with the Creature Editor, especially the winners of the recent Template Challenges on the Spore forum. 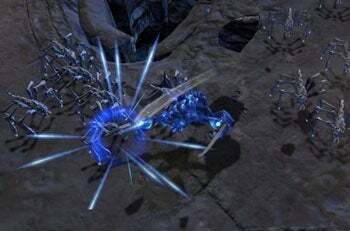 When we import player-created enemies into Darkspore, they will gain all the graphics advancements we’ve made, including new animations, behaviors, and abilities. GO: Can your creature(s) physically evolve over the course of the game, or are their abilities static add-ons? If the former, does the gameplay "adapt" accordingly, as it did in Spore, or did you have to clamp down on the way evolution iterates to ensure game balance? Jeff Gates: Each Genetic Hero has a set of unique abilities that can be used in combat. In Darkspore, players will collect parts to upgrade their hero’s abilities. Parts are randomly generated based on level difficulty along with how successfully players complete the level. We use a 'suffix system’ to ascribe gameplay bonuses to the parts. For example, "Tiberium Armor of Deflection" allows heroes to avoid energy bolts, while "Tiberium Armor of Absorption" might take those same energy bolts and transform a percentage of their damage into power for the hero. By having the gameplay 'suffix' independent from the aesthetics of the part it is possible for players to find the gameplay stats they are interested in, while at the same time being able to customize their hero with the look they want. These upgrades will have varying levels of effectiveness on each of the different characters. Collecting the right combinations of characters and parts is a key area of strategic optimization in Darkspore. To ensure players face an appropriate challenge, our campaign and “chain game” modes get progressively more difficult. Advanced players with well honed squads may initially advance a bit more rapidly, but will quickly find themselves comfortably challenged. Next: Action-RPG or real-time strategy game?